When you bring food to a neighbor or a friend, you are wisely letting the food fill in the gaps. Sometimes we say all the wrong things, but food knows all languages. It says, I know you are inconsolable. I know you are fragile right now. And I am so sorry for your loss. I am here if you need me. The bringing of food has no denomination and no race. It is concern and sympathy in a Pyrex bowl. In the kindest sort of way, it reminds us that life continues, that we must sustain and nourish it. Funeral cuisine may be an old custom, but it is the ultimate joining of community and food—it is humanity at its finest. When I turned the last page of Michael Lee West’s Consuming Passions, I can honestly say that I had a smile on my face. It wasn’t because I was happy to have finished my read but because it was such a satisfying one. Consuming Passions is all about food and family. Readers travel with West as she examines the food of her Southern childhood in Louisiana to the food of her adulthood. There are plenty of tales about her eccentric family and sprinkled within these stories are recipes that will have you marking pages so you can try them like the coconut cake that takes eight days to make. What I really love about this book is how much of a role family, from great-grandmothers to husbands and children, have in this book. It was family that taught West how to cook and gave her a passion for food along with some of the best memories. Most of the recipes that the author shares come from her family and friends. I didn’t realize it until I was almost an adult, how important it is to pass down the recipes of our lives to our children. The meatloaf and mash potatoes of my childhood is a recipe from my mother that I love making when I’m stressed on cool nights. My favorite meal is the enchiladas that I learned from my father, who I can’t help but think about when I make them. 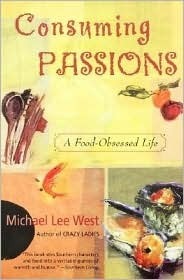 Consuming Passions is a rich and hilarious read that I recommend for food lovers and fans of Southern Lit. Even when I’m all by myself, I never cook alone. My grandparents are dead, along with my father and some favorite aunts. Dell disappeared into the wilds of Florida. But my family lives on in their recipes. I bring Mimi’s chocolate cake to potlucks and Aunt Tempe’s majestic coconut layer cake to holiday parties. I make Aunt Blanche’s pancakes on Sunday mornings. The aunts, living and dead, left me with a legacy of food—and the confidence to cook it. Whenever I smell apples, I think of Mimi peeling winesaps in my old red kitchen. The memory of Dell goads me into serving experimental entrées to hapless guests. Whenever I’m making biscuits, cutting them out with a child’s jelly glass, I feel my grandmother hovering. She is somewhere over the pot rack, telling me that biscuits are like cats, they don’t take to handling. “Am I doing this right?” I ask her. This sounds like a wonderful book. In the hustle and bustle of modern day life, I think we’re losing some of the value of meals shared with family. This sounds like such a great read. I’m definitely adding it to my to-read list. I love books about food and family – they are just such satisfying, comfortable reads. Oh, since this was so totally different I didn’t even notice at first, but I have read this author before. Crazy Ladies was a total whim way before blogging and I still own it! I should really read something else… Or reread that one because I can’t even remember why I really enjoyed it anymore! I a;so think it’s really important to pass down those family recipes that have made an impression in your life. I know that that didn’t happen with my grandmother, mother, and myself, and I aim to do better with my daughter. This sounds like a wonderfully warm book that I would love to add to my collection. Thanks for sharing both it, and your thoughts on it with us today! Love the sound of this. My grandmothers are always with me in the kitchen. I was blessed to have been born into a family of excellent cooks and no picky eaters. I love the quotes you chose … so true! The book sounds wonderful. This sounds like a fantastic book. There is a reason why the kitchen is always the center of a home, and why most parties end up in congregating in the kitchen. Family and food are the perfect combination. you’ve sold me! i’m adding this book to my wishlist as i write this comment. i love books about food and family! Sounds like a wonderful read. I never understood the joy of cooking until I was an adult, so I don’t really have any memories of helping my grandma in the kitchen. I wish I did.